Applications are hereby invited in Standard Form of application (Assam Gazette Part-IX) from candidate to be engaged as Helper in Circle Project Management Unit of NRC Updation Project in the Office of the Circle Officer, Golaghat Revenue Circle. The post shall be on Contractual Basis @ 6000.00 (Rupees Six Thousand) per month. Age: 38 yrs. Only candidates aged not less than 18 years as on 01.01.2018 can apply. b. Working knowledge of Computer in essential. For the positions the applicants shall have to travel extensively throughout Golaghat Revenue Circle, Golaghat and occasionally outside the district as well. 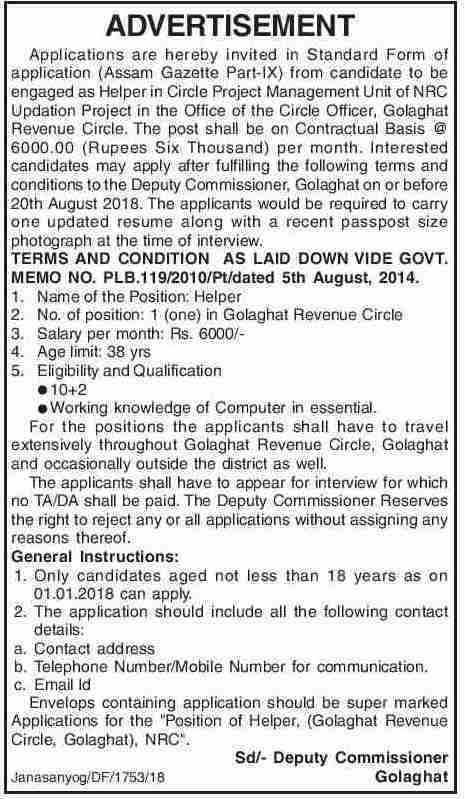 How to apply: Interested candidates may apply after fulfilling the following terms and conditions to the Deputy Commissioner, Golaghat on or before 20th August 2018. The applicants would be required to carry one updated resume along with a recent passport size photograph at the time of interview. b. Telephone Number/Mobile Number for communication. Envelops containing application should be super marked Applications for the "Position of Helper, (Golaghat Revenue Circle, Golaghat), NRC".